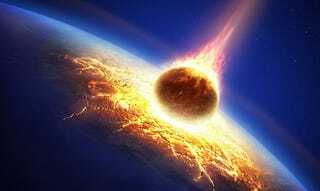 Roughly 3.3 billion years ago, Earth’s early life forms were plunged into an unimaginable hell, when a series of massive asteroids smashed into the young planet, vaporizing the oceans and scorching the skies. The new findings come from studying a geologic formation in South Africa known as the Barberton greenstone belt. Within this belt are 8 distinct layers that chronicle asteroid impacts occurring some 3.5 to 3.2 billion years ago. The two layers discussed in the current study are filled with tiny silica pellets, which the geologists interpret as indicators of molten rock rainstorms that took place after asteroids fried the Earth’s surface.